The Indigenous People of Biafra (IPOB) may have withdrawn its threat to stop the conduct of the November 18 governorship election in Anambra State. 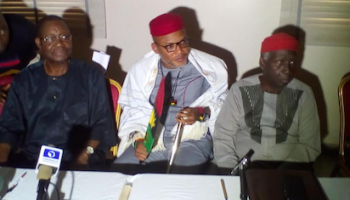 The decision was reached after a meeting organised by a non-governmental organisation, the Ala-Igbo International Foundation with the leader of IPOB, Nnamdi Kanu, in Owerri, the Imo State capital. Leader of the foundation, Prof. Uzodinma Nwala, said after much deliberations which they claimed was still ongoing, the IPOB has assured the Igbo leaders that it won’t disrupt the November 18 governorship election.